Organic is always perceived as “expensive” and “high-end” products. But have you thought of what you are consuming every day? Pesticides? Chemical? Herbicides? Or REAL FOOD? In order to meet the demand of populations, food products are produced massively. Due to shelf life issue, quantity on shelves issue, profit issue, there are too many “black-hearted” cases regarding processing of food happening around the world. Can you be sure of what are the content / nutrition / additional additives inside the food you are consuming? Why risk our health and our life when we have a choice? Yes, it might be a little bit costly, but we are sure that the medical expenses you might be spending in the future would not be less. (oh, it’s a little bit cruel to tell the truth). So, Organic or Chemical? It’s your choice. Organic food is produced by farmers who emphasize the use of renewable resources and the conservation of soil and water to enhance environmental quality for future generations. 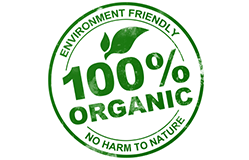 Organic food is produced without using most conventional pesticides; fertilizers made with synthetic ingredients or sewage sludge; bioengineering; or ionizing radiation. Before a product can be labeled "organic," a Government-approved certifier inspects the farm where the food is grown to make sure the farmer is following all the rules necessary to meet USDA organic standards. Most of the organic products are produced overseas. Malaysia produce only very limited quantity of organic products. Hence, most of the organic products found in market are imported. In overseas, many organic farmers do not receive federal subsidies like conventional farmers do. Therefore, the price of organic food reflects the true cost of growing. Besides that, organic farming is more labor and management intensive. Organic farms are usually smaller than conventional farms and so do not benefit from the economies of scale that larger growers get. Anyhow, it’s still worth the price, buying yourself a better health and living! Scientists now know what we eaters have known all along: organic food often tastes better. It makes sense that strawberries taste yummier when raised in harmony with nature, but researchers at Washington State University proved this as fact in lab taste trials where the organic berries were consistently judged as sweeter. Plus, new research verifies that some organic produce is often lower in nitrates and higher in antioxidants than conventional food. Let the organic feasting begin!